United Naturals is a digestive health company started in 2017 by a Canadian founder. Their first product is Synbiotic 365 which contains a novel blend of probiotics, prebiotics and B vitamins. Based on my 9 years running Probiotics.org, this is one the most carefully researched probiotic blends I’ve ever found. It’s well suited to digestive health, plus it supports vitamin B deficiencies that are common in people with digestive issues. Synbiotic 365 is a very innovative “3-in-1” product for digestive health. What Was The Inspiration For Creating Sybiotic 365? I interviewed the Canadian founder of United Naturals about how he become interested in digestive health. He said that his initial interest in digestive health came from his girlfriend who was having life-destroying digestive issues. He started looking into what might help her digestive health, and landed on probiotics. Laboratory testing also found that her vitamin B levels (B12 and B6 were most deficient) were quite depleted. And because she was having issues digesting vegetables containing prebiotics, her digestive health was further boosted by taking a prebiotic. Even though this combination of probiotics/prebiotics/B vitamins worked well for his girlfriend digestive issues, United Natural’s founder wanted to make sure it was the perfect digestive health formula. So he teamed up with Dr. Vincent Pedre out of New York to perfect the the Sybiotic 365 formula. Dr. Vincent Pedre specializes in internal medicine and was educated at Cornell university. Dr. Vincent Pedre brought out his extensive medical knowledge and experience to create the optimum digestive health formula. This new formula reflects the latest probiotic and digestive research. And this product may be your best chance for better digestive health. In this part of the review we’re going to break down every single ingredient that this product has. 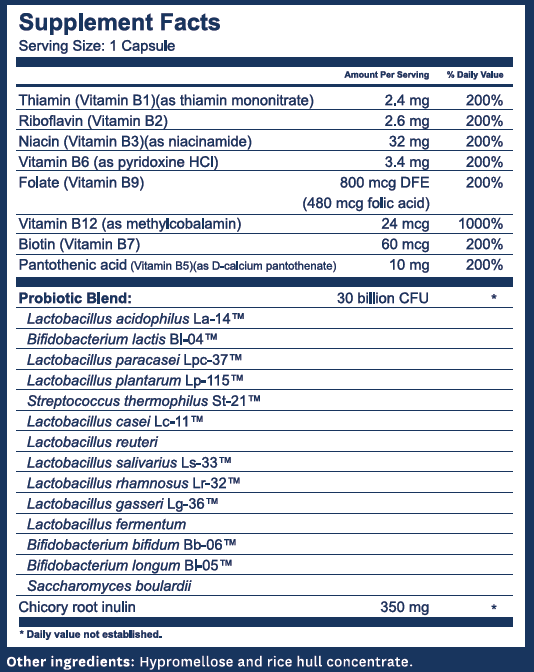 I’m very impressed with the large range of highly research probiotic strains in this product. I’ll go over the dosage and individual strains below. This United Naturals probiotic has 30 Billion CFU in each capsule. And if you’ve downloaded our probiotics buying guide, you know that that’s a great starting dose of probiotics. This “Goldilocks CFU” is the highest dose I recommend to people buying their first probiotic…it’s a good dose that reduces the chance of side effects, yet it’s strong enough for most people to have symptomatic relief. And if someone wants a higher dose, they can take multiple capsules, spaced throughout the day. This product has 14 different probiotic strains in it. Each one of these strains is extensively researched and have research supported digestive health benefits. Additionally, many of these probiotic strains also have immunity and anti-allergy health benefits. This product contains 350 mg of chicory root inulin. This is a high quality plant derived prebiotic and is very well researched. An extremely common B vitamin deficiency for people who have digestive issues is B12 deficiency. Because of that, Sybiotics 365 has 1000% of the daily value of this nutrient. People can have all sorts of health problems from thinning hair, all the way to extreme fatigue by being deficient in B vitamins. So I like that this product supports those aspects of our health as well. The inactive ingredients are hypromellose and rice hull concentrate. I know for a fact rice hull concentrate is safe unless you have a rice allergy which is quite rare. I looked into hypromellose and I couldn’t find any credible evidence that there is anything unsafe about it. There were some crazy hippie blogs saying it was bad, but those blogs did not show any evidence or sources for why it is bad or unhealthy. I took this product and didn’t notice any effects myself. United Naturals made this probiotic to be consumable for people with food allergies and sensitives. Please see the allergen information below. The founder told me that this product is gluten free, and people with Celiac’s disease have not had negative reactions to the product. I have a very good friend with Celiac’s disease, so I’m glad he can take this product without fear. This product contains no diary or lactose. The manufacturer of this product says that some dairy is used in culturing the probiotic strains. But only extremely trace levels of dairy should be present. The founder says that there have been no complaints or issues for people who are dairy free. There aren’t any eggs, nuts or soy in this product. There is also no cross-contamination of these allergens. None of the ingredients in this supplement contain genetically modified organisms (GMO’s). 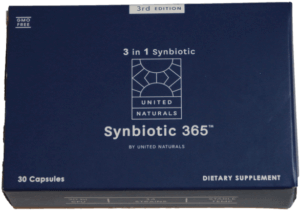 What Is The Synbiotic 365 Starting Dosage? The starting dosage for Sybiotic 365 is just 1 capsule per day. I like to take the capsule on an empty stomach with 8oz of water. Yes! I really respect companies that give a money back guarantee. That shows that the company believes 100% in their product. And for you, there is no risk in trying this product. Are There Any Synbiotic 365 Scams? I didn’t have any issues with this product. The ingredients are clean and the research behind them looks sound. No complaints from me. Does United Naturals Have Good Customer Support? I called their company after hours, left a message and got a call back early the next day. I think that’s very responsive and reasonable. 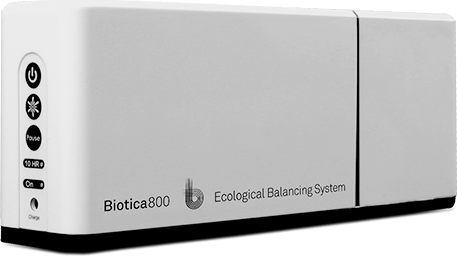 Where Can You Purchase Synbiotics 365? The best place to purchase this product is direct from the manufacturer. You can buy just 1 box, or, you can get a large discount by ordering ordering multiple boxes. I just purchased a large supply of Synbiotic 365 and have taken 1 per day for the past 5 days. I stopped Prilosec and all other antacids. I have a long history of ulcers, gerd, stress, anxiety and overeating. Basically that’s all in the past. I’m 76 and in good health. I exercise regularly, eat healthy but still have night time munchies. I’m feeling very positive about using Synbiotic. Is there any benefit to increasing my dosage by adding one more pill per day? There is a greater risk of probiotic side effects by taking more than 1 pill per day. But, if it works for you without side effects, I say full steam ahead. I posted a picture of the ingredients…there is no cyanide lol. Reviewers need to have some scientific literacy – geeze. That’s like saying methylfolate is methamphetamine…when methylfolate is a great nutrient found in green leafy vegetables. I would ask your doctor to make sure if it’s okay for you in your situation. I haven’t heard of any issues personally, but always check with your doctor. There are 30 doses in each box – enough for 30 days. Hi Evan Is there anywhere in Canada that I can purchase this product? Yes! They will ship Synbiotic 365 right to your door. You should click here to order in it Canada. Is this product safe to take daily long term. Can you ever get to much bacteria?? I don’t think there are any known issues to taking a probiotic “long term”. I would be sure to address other lifestyle factors that affect your health as well though. Is it ok to take a daily multivitamin pill along with Symbiotic pill? The only way to say for sure is to ask a doctor. That doctor will know any medical conditions that you have, and he/she will know the exact multivitamin you are taking. Then, your doctor can make an informed decision. For most people I believe the negative risk of interaction is extremely low, but I can’t say for sure. You would have to speak with a doctor. Yes, Synbiotic 365 is endorsed by Dr. Vincent Pedre. Dr. Vincent Pedre specializes in internal medicine (and gut health is one aspect of that). He was educated at Cornell university. The only way to be sure is to ask your doctor. To me, the ingredients look safe for 13 year olds. But, I am not a doctor. So ask your doctor to be sure. Will Synbiotic 365 interfere with the vitamins i’m already taking? I don’t know what vitamins you are taking – so I can’t say for sure. To be 100% sure, ask your doctor. But, I can say is that the only possibility would be having too much of B vitamin complex. But the quantities of B vitamin are quite low compared to health problem doses listed on http://www.OPSS.com. So I think the risk is extremely minimal. Again – to be sure, check with your doctor when taking new supplements. Especially if you have health problems already. How many tablets or capsules in 1 box? There are 30 capsules in blister packaging. That is enough for 30 days. Hi I am 25 years old and am healthy allready. I am taking these to help with my general health and to possibly clear up my acne from bad bacteria in my body. Were i am young I was wondering if it is ok to take one of these supplements every 2 days instead of every day? I would strongly recommend you begin with the recommended dose. Once your body gets accustomed to that dose, then you can take a second capsule – say every other day. Once you’ve done that, then you can up the dose to 2 capsules a day if you’re not getting any probiotic overdose effects. Remember that health is a marathon – not a sprint. Slow and steady will win the race to health. I have been taking Synbiotic 365 for just over 30 days I started my second box three days ago and I like how this product is working in my body. My digestive system feels happy. I am overweight and have been for years and I noticed since I have been taking this product I do not require much to eat. Oh I eat something for breakfast and again at mid-day but then I am done. I might has a small snack fruit or some chocolate but my appetite has curved greatly. My energy level has increased also. I was planning to continue taking the product but should I stop at some point? That’s a great question. And the short answer is that I don’t think there is any proven harm to taking a supplement like Synbiotic 365 long term. I know that anecdotally some health practitioners like to cycle probiotic supplements, say every 3 months. But I also know that anecdotally many patients don’t feel as well when they’re off those supplements…so they suffer until they go back onto the original supplement. I’m a big believer in trying to understand why a supplement is helping me, and then bring those things into my life through diet or lifestyle changes. If I can figure out what those things are, then I’ll replace the supplement with those new foods, exercise or lifestyle changes. I am on week 2 of using product and have already been blessed with reduced stomach bloating and not taking Prilosec anymore – I feel so much better. Question: how many calories and are there any carbs? Neither are listed on label and I track both. I don’t think this product is a significant source of calories. Calories come in carbohydrates, fats and proteins…and this product doesn’t have any of those. Is this product safe while breastfeeding? You should ask your doctor. I reordered 6 more boxes (for the significant savings of Synbiotic 365 which appears to help my slow intestines and therefore my bowel movements. I an fairly pleased with how this probiotic has helped with that issue. After I placed my order another page popped up to buy Enzyme 365. This came yesterday and I can’t remember what benefits this offers plus when should I take this supplement? Enzyme 365 is an enzyme that improves digestion of food for people who are deficient in some or all enzymes. I would personally take a capsule in the middle of a meal, but it’s best to go by the directions that are printed on the bottle. Is the preparation, including the capsule, vegetarian? Yes it is. The capsule is made of cellulose. If I started the 365 probiotics today, when can I safely stop taking omeprazole for acid reflux. That is a great question for a doctor. I have a 10 year old daughter who is currently taking antibiotics for atopic dermatitis, a condition she has suffered her entire life. Is she old enough to take this product? There are lots of research studies with children taking probiotics. But, your daughter’s case may be different, so I’d recommend checking with your doctor. are any of these contraindicated with Synbiotic365? I am a cardiac patient 4xcabg plus 11 stents, anxiety, stomach and esophagus spasms. I’d like to order. I have the video on hold. I sure hope I can get an answer asap. I’m sorry I can’t say for sure. You would have to speak with your doctor. Yes it can. I would recommend either keeping it in the fridge or keeping it outside of the fridge. If you leave it out for an hour and then put it back in, then condensation can happen which can decrease the potency of the probiotic. It doesn’t matter if you do it a few times, but if you have large temperature swings every day, then that can affect the potency over time. Can you take synbiotic 365 along with Garcinia Cambodia. I also bought Enzyme 365. Probiotics, prebiotics and B vitamins are not listed as reacting badly with Garcinia cambogia. So I don’t think there are any known bad interactions with Synbiotic 365’s ingredients. But, to be safe, it’s always best to ask a doctor. My name is Gary Rose I have Parkinson Disease for the last fourteen years. Do you have opinion that having a leaky gut could cause a lack of Dopamine to be produce to the brain. Does the Vagus Nerve have anything to do with having tremors. I’m sorry I don’t know. I would speak with a doctor or look for research studies on Parkinson’s disease. Is it safe to take 365 when you have diabetes? I would guess – as a non-doctor – that it’s fine. But you should ask your doctor. Always ask your doctor. I bought Synbiotic 365 and Enzyme 365 but didn’t get get equal qty. I don’t see where to buy refills of just Enzyme 365. Ideas? I’m glad they’re working for you. hi, My name is Maurice and I was wondering if the United Naturals product is safe. I was looking into your product and I saw that “United naturals” was not listed as a certified company with the “Better Business Bureau” I was wondering why they aren’t certified. I can tell you that my dealings with the founder have been good. They honor their return policy and have a very good bunch of products. I will suggest to the founder that he should get certified with the BBB. Are there any mushrooms in this product? I am allergic to them. I checked with the company and there are no mushrooms in this product. hOW MUCH DOES TJHIS PRODUCT COST? You can use click here to check the price. I would like to try the Synbiotic 365 but I am currently thanking blood pressure and cholesterol medications.How would synbiotic react with these meds..
You would need to ask your doctor/pharmacist to be sure. I takeAlign which is a probiotic supplement should I discontinue this since I just started Syn. 365? I would take probiotic products 1 at a time so you can see which one works better. Does this product help in weight loss? Can it be used for weight loss? Does it curb the appetite or burn fat in the body? There is evidence that probiotics can help with weight loss. But, I don’t think this company claims that. That being said, I have read some customer testimonials where Synbiotic 365 customers said they lost over 5 lbs of weight after starting to take this product. Can you mix this product if your taking other medications? You have to check with your doctor to be sure. I am really interested in your product, do you deliver to Canada? Yes, you can get it delivered to Canada. I have read that it is more important to take prebiotic to feed your probiotics ! That taking probiotics is a waste of time and money, if they can’t feed on prebiotics ? A probiotics product doesn’t has to have prebiotics to be effective. With the right diet, you can get enough prebiotics. But few people eat that way! Does it contain iodine or seafood product? Hi, when is the best time to take this pill? Morning or nights? Thanks. I would take it on an empty stomach, first thing in the morning. You can also try taking it right after you’ve had breakfast…but I would generally take it first thing in the morning. The phone number for United Naturals is 844-794-7728. I would like to try this product but I would like to know the ingredients. Does this product contain garlic or onion in any form? Is it purely vegan? Garlic and onion are not listed as ingredients. It is a vegan product. I was wondering if’s pregnant women can take this probiotic? There are research studies with pregnant women using probiotics safely. But, you should always ask your doctor if it’s okay for you to take a supplement. You could have specific health conditions that make it a bad idea for you to take certain supplements. I am taking and have been taking a prebiotic for over a year. They have taken heart burn away completely. I stoped all ainacids, I did purchase 6 month supply of symbiotic 365 and want to try them. Should I take them with or without my prebiotic. Synbiotic 365 has a prebiotic in it. So if you took your normal prebiotic with it, then you could have too much prebiotic. Too much prebiotic can cause bloating. I would try just taking the Synbiotic 365 by itself. Then, after a few weeks, I would add in the prebiotic every other day. If you still felt okay, you could take the prebiotic every day. You’ll have to experiment a bit and find what works for you. Was interested until I noticed the B vitamins are synthetic and not bioavailable for the body. This is the cheap version of B12, Cyanocobalamin. I expected the higher quality Methylcobalamin or Hydroxycobalamin. I just spoke with the manufacturer, and they use Methylcobalamin. I’ve updated the review article to reflect that! I cannot swallow pills. Could I open the capsules and mix with something? Yes – that should be okay. You want to mix it with cold water – not hot or boiling. I have had digestive problems my entire life. Runs in the family. I have been taking the product for a little over a week. 1st week could tell my body was getting rid of all the toxins and poisons. By day 6 I have been having reg. Bm’s and I am gaining energy every day. No more omeprazole problems. No heartburn or acid reflux at night. Thank you for a no nonsense resolution. I am on chemo for stage 4 colon cancer Metz to liver. Ok to take? I would like to get off omeprazole. It’s important to ask your doctors if that is okay to take. Do I need to continue taking Super B complex if I am taking Synbiotic 365? I would double check that you aren’t overdoing the B vitamins. Is this a capsule or pill? Is this live bacteria? My understanding of efficacy is that the bacteria must be live. Synbiotic is a capsule that contains live probiotics. The probiotics are freeze dried in a very careful way to make them hibernate or go dormant…but they are still alive. Once the probiotics get into your intestines, they wake up and become active again. The heat and moisture of your intestines wakes up the probiotics again and then they go to work. Is there supposed to be Chicory root in Synbiotic 365 or is that separate? Yes, chicory root is in Synbiotic 365. No, these won’t make you feel bad if you stop taking them after 3 months. I was scheduled for a colonoscopy on May 1st, 2019. My 6 month bout with diarrhea warranted a look see. I decided to try Synbiotic365. It has been nearly three weeks. I have no more diarrhea and the Dr canceled the colonoscopy. Works for me!! Thank you to United Naturals. Just received my synbiotic 365, my question is I take royal jelly, a daily vitamin, garlic, and fish oil daily, are these ok to take along with symbiotic 365 or which ones should I not take? I think it’s fine to take those together. Only thing is, you want to check how much B vitamin is in your vitamin supplement, so you don’t over do it. hello i am considering purchasing a 3 month supply to start off, but I am concerned about the chicory root, I read on a google search that it can cause stomach upset and other gastro related symptoms, what are the benefits of including chicory root if it is questionable? at least to me. Chicory root is a prebiotic. It is like fertilizer for the probiotics you take. So it amplifies the effect of taking probiotics. Chicory root also helps relieve constipation and improves digestion. I wouldn’t expect the amount in this probiotic to cause side effects. It’s a pretty small dose of prebiotics.